British supermarket Tesco has said it will acquire 36 discount stores from E-Land in South Korea for 1.95 trillion won ($1.87bn; £958m). The majority of the E-Land stores had belonged to French retailer Carrefour in 2006. Most of the stores will become Tesco Homeplus outlets, the second-largest discount chain in South Korea. 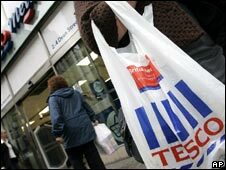 Tesco has been expanding in key foreign markets such as the US, and its 2007 international store sales rose 25.3%. Terry Leahy, chief executive of Tesco, said after nine years in South Korea, this latest acquisition marked an important "strategic move," allowing the firm to accelerate growth in this "key market". According to Tesco, the grocery market in South Korea is valued at more than $100bn (£50bn) annually.